With Scritti Politti’s official summer UK started yesterday in Brighton, this is a most fitting time for a recording of the first ever gig to pop up and amaze. 28 Years ago, November 18 1978, in Acklam Hall this was recorded. The song is called Art Forever, a genuine lost song found again. John unearthed this little gem, and it sure does sound sweet! Also, the ticket for the gig. Thanks Russell from Barrow-in-Furness for this unique material! in 1980 – 1982, I shared a house in north London with rough trade stalwarts ‘Swell Maps’. Epic, the sadly passed on drummer, used to bring back EVERY single released during that period, and make his housemates compilation C90s. he made me a ‘complete Scrits’ tape just after ‘Songs to Remember’ was released, which included this unidentified gem. i did remember, as well as one can after 23 years, the gig was part ofn a shared bill with Epic and the Scrits, at the Acklam Hall. 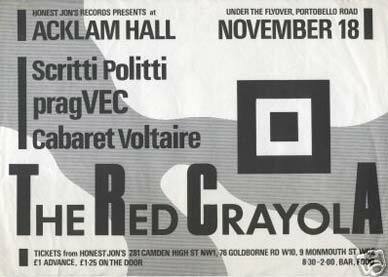 Thanks to John for getting the ticket, as Epic was the drummer of Red Crayola at that time. the tape of the full concert was given to him by Tom Morley, drummer to drummer. I’m very pleased to hear the song ‘clean’ after years gently preserving it on old Walkmen… and I wonder how many other lost gems are floating out there in the aether. Wow! Thank you so much for uploading this! Bibbly-o-tek has become a wonderful public repository for everything Scritti-related, and it’s wonderful to see the back-catalog growing as well as every new radio interview or live recording of the current lineup. However, as good as everything is that Green does, I think Nial Jinks and Tom Morley had a unique genius for supporting and particularly subverting anything Green chose to turn his craft to. If anyone else has more sound files of that first lineup, I’d certainly pay good money to hear them. I agree with Zach on all the above. The ’78 – ’80 live collection (of whatever recording quality) is the real gap in the market for Scritti listening. More, please, from whoever has whatever old cassettes stashed in their attics. Thank you so much. Truly amazing!